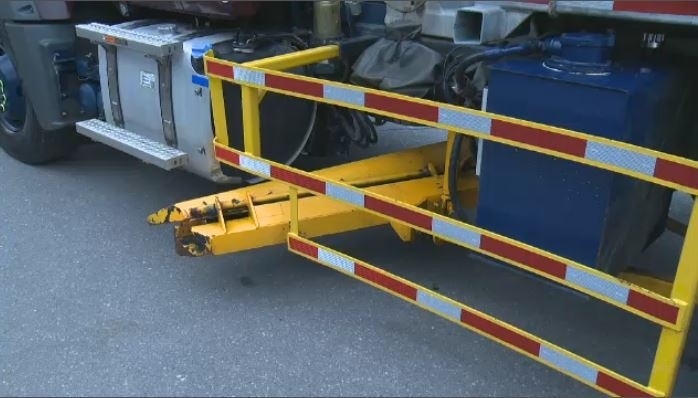 On Monday, Montreal’s opposition party will table a motion to force the city’s suppliers to have side guards on their trucks starting in January. The mechanism, often made of steel, is attached to the bottom of vehicles and is intended to prevent pedestrians or cyclists from going under the truck. The borough of St. Laurent first adopted the measure in 2012, followed by Westmount. The City of Montreal itself has side guards on its entire fleet of trucks. Those rules, however, don’t apply to city suppliers. Ensemble Montreal will table a motion at city council asking that all companies working with the city be required to have side guards by January. “It we can save just one life, it would be worth it,” said DeSousa. The pressure for mandatory side guards has been more than a decade in the making. In 2005, Jessica Holman-Price was killed by a snow removal truck in Westmount after sliding underneath the wheels while trying to rescue her brother, who was trapped. He survived, and in 2015 Holman-Price was honoured posthumously by the Governor General with a Medal of Bravery and two new public benches in her name. In early 2017 as opposition leader, current Montreal mayor Valerie Plante tabled a motion that mandated all trucks working for the city to have the guards. However, since being elected, nothing has changed. “This is a chance for Montreal to shine and I don’t know why they’re not,” said Holman-Price’s mother, Jeannette Floyd.